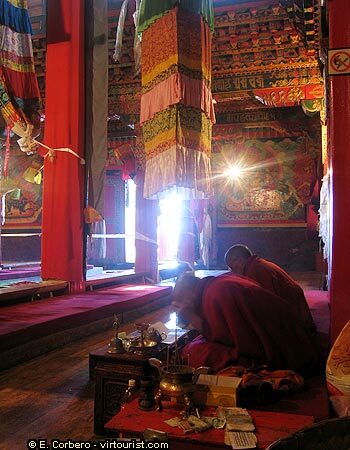 Inside the hall, monks pray and recite Buddhist scripts. Click on the picture for the video clip. Although the monastery was almost completely destroyed during the "Cultural Revolution", it has recovered its lost splendor since then. Most of the original temples have already been rebuilt. Local authorities are sponsoring the reconstruction of the rest of them. More than 700 monks and lamas live today in the Monastery.